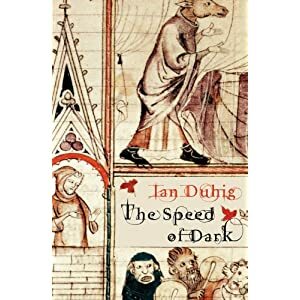 Ian Duhig is another local poet. Though born in London from Irish descent, he graduated from Leeds Uni and I’m pretty sure he still works around here. He has a recent collection out, Pandorama , which I intend to get soon. I do however have The Lammas Hireling and The Speed of Dark . The poem I think I want to share can be found on page 21 of this .pdf: http://www.thepoetrytrust.org/images/uploads/pdfs/2008_apf_prog.pdf but I’m going to rudely reproduce it right here. It’s from The Speed Of Dark. She snorts. Her face grows dark while mine glows red. they took the air to run rings round the sun. where horses were his metaphors for breath. These sentences are sentences of death. There’s something about what I have read of Duhig’s work so far that I really like. His books are riddled with nice uses of very traditional forms, but there are sill silly parts that don’t take themselves very seriously at all. Also, when these fail a little and just turn out just slightly daft (“although i’m now senile / at least i’m not senile”), I think this is endearing rather than annoying. Incidentially, there is a truly gross poem in The Lammas Hireling about Chinese foot binding. 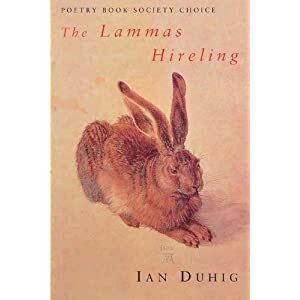 This entry was posted in Uncategorized and tagged Ian Duhig, poetry. Bookmark the permalink.